Frankincense, an oily gum resin from the tree Boswellia sacra and related species, is named in the Bible as one the three gifts given to the baby Jesus by the 'Three Wise Men'. It has been used for thousands of years in many different cultures. Altitude range: 5–1230 metres above sea level. 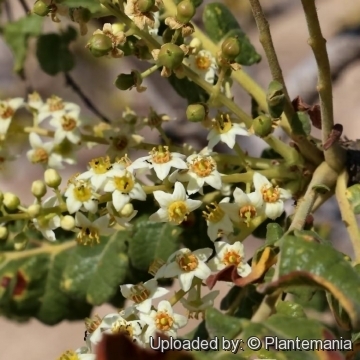 Habitat and ecology: Boswellia sacra is abundant in arid woodland, on steep, precariously eroding slopes and gullies, and tolerates the most critical situations and often grows in calcareous soil. It is also found in the 'fog oasis' woodlands of the southern coastal mountains of the Arabian Peninsula. The trees cling to boulders or rock-faces by means of a cushion-like swelling at the base of the trunk. This swollen base helps to stabilise the tree and is most developed in those growing on very steep or exposed rocks. Animals in Oman often browse on the tree's foliage, flowers, and seedlings, resulting in scant regeneration; the mature trees that remain are apparently dying. 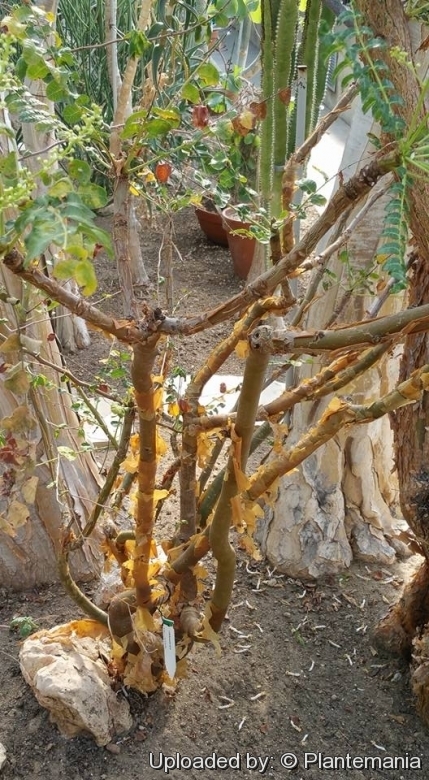 Recent studies have indicated that frankincense tree populations are declining due to overexploitation. In Oman the tree is so heavily browsed that it rarely flowers or sets seed. Trees appear to be dying and regeneration is poor. 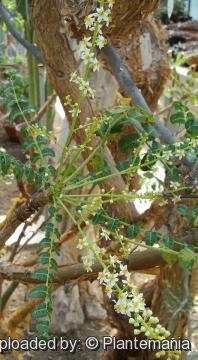 Boswellia bhar-dajiana var. serrulata Engl. Boswellia carteri var. subintegra Engl. Boswellia carteri var. undulato-crenata Engl. 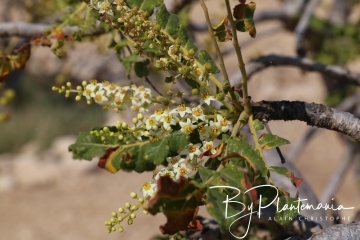 Description: Boswellia sacra belonging to the family Burseraceae, is a woody deciduous plant, which reaches a height of 1.5 to 8 m, with one or more trunks. Its bark has the texture of paper and can be removed easily. It has compound leaves clustered at the ends of tangled branches and an odd number of leaflets, which grow opposite to one another along its branches. The new leaves are covered with a fine down. Its tiny flowers, a yellowish white, are gathered in axillary clusters composed of five petals, ten stamens and a cup with five teeth. Boswellia sacra is the primary tree in the genus Boswellia from which frankincense, a resinous dried sap, is harvested. All parts of the tree are highly resinous. Stem: Treelike with a well developed trunk, often somewhat swollen (pachycal) at base, or branched almost from ground level. Individual trees growing on steep slopes tend to develop some buttressing that extends from the roots up into the base of the stem. This forms a sort of cushion that adheres to the rock and ensures a certain stability. Bark pale brown with a flaking papery outer layer over a thick reddish-brown resiniferous layer. Ttwigs stout. Leaves: Oblanceolate in outline, 10–25 cm long, including a less than 10 mm long petiole, (11–)13–19-foliolate. Leaflets lanceolate, oblong, elliptic or broadly ovate, up to 5(–7.5) long, 2(–3.5) cm wide, obtuse to subacute at the apex, broadly cuneate or truncate and often asymmetric at the base, the margin often somewhat undulate, usually crenate, upper surface densely hirsute to subglabrous, lower surface much paler, hirsute to densely tomentose with a prominent network of veins. Flowers: In glabrous to sparsely pubescent racemes or little-branched panicles 6–26 cm long, the 0.5–4 cm long peduncle included; bracts 1–2.5 mm long; pedicels 2–8 mm long. Calyx 2–2.5 mm long, glabrous. Petals white, 4–5 mm long, 2–2.5 mm wide. Filaments glabrous, 2–2.5 mm long, linear; disk shortly tubular, yellow-orange, 1–1.5 mm deep. Fruit (capsule): 3–4(–5)-celled, 8–12 long, 3.5–9 mm wide, narrowly to broadly pear-shaped, glabrous. Seeds (stones): 4-pointed with narrow apical and basal horns and broader lateral points, often surrouded by a persistent wing. 2) Wikipedia contributors. "Boswellia sacra." Wikipedia, The Free Encyclopedia. Wikipedia, The Free Encyclopedia, 11 Dec. 2016. Web. 11 Dec. 2016. 3) Thulin, M. 1998. Boswellia sacra. The IUCN Red List of Threatened Species 1998: e.T34533A9874201. http://dx.doi.org/10.2305/IUCN.UK.1998.RLTS.T34533A9874201.en. Downloaded on 02 January 2017. 4) Oldfield, S., Lusty, C. and MacKinven, A. (compilers). “The World List of Threatened Trees.” World Conservation Press, Cambridge, UK.1998. 5) Thulin, M. “Comments on the draft species summaries of trees occurring in Somalia”.1997. 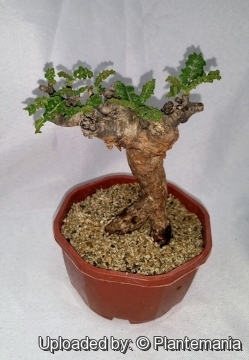 Cultivation and Propagation: Boswellia sacra is a favorite bonsai species amongst bonsai enthusiasts. It is a slow-growing species and plants are somewhat sensitive to frost. Quite easily actually, and strangely enough, they are killed more from love than neglect. Over-watering in winter is probably the biggest cause of death with this species. They have very soft wood and if it receives too much water in the dry months can quite easily rot. It does not put out a deep taproot but develops a good network of smaller roots and can be planted in quite shallow pots. From a bonsai point of view, another very desirable feature of this species is its ability to heal from quite drastic surgery. Propagation: By means of seed and cuttings. Uses: The gum-resin of B. sacra is the frankincense most valued for use in churches, mosques etc., and is also used in the perfume industry, as well as in traditional medicine. It is a major export commodity from Somalia. In parts of Oman, the smoke generated during the burning of oleo-gum resins harvested from this species was used to perfume clothes, hair, and houses. The fumes also repel mosquitoes and other insects. Frankincense has a long history of medicinal, religious and social uses. For example, in some Arab communities the gum is chewed to treat gastrointestinal complaints, but should not be swallowed. The trees start producing resin when they are about 8 to 10 years old. The resin is extracted by making a small, shallow incision on the trunk or branches of the tree or by removing a portion of the crust of it. The resin is drained as a milky substance that coagulates in contact with air and is collected by hand. Growing conditions vary significantly, affecting both tree development and resin produced.